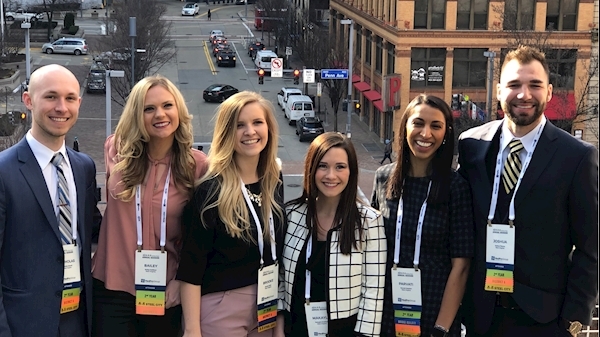 The West Virginia University School of Dentistry chapter of the American Student Dental Association, ASDA, was recognized for progress and leadership by the national organization. Makayla Gresham, president of WVU ASDA, is among the new office-holders chosen at ASDA’s annual education and awards weekend. Gresham was elected District 6 Trustee for 2019-2020. The third-year dental student is the first person from the WVU School of Dentistry to hold a national ASDA position. She will represent her dental student colleagues from WVU, Ohio State University, Case Western Reserve University, University of Michigan and the University of Detroit Mercy. “Annual session is always an amazing experience, but this year’s is one I will surely never forget. It is such an honor to be elected ASDA District 6 Trustee and represent not only my school, but my district and association as well,” Gresham said. As a group, WVU ASDA was recognized at the March 1, 2019 session’s Gold Crown Awards Ceremony as the “Most Improved ASDA Chapter”. ASDA is a national student-run organization that protects and advances the rights, interests and welfare of dental students. The yearly meeting brings together students from each of the country’s 66 dental schools. In addition to voting on association policy, the event is a chance to hear from established and experienced oral health care professionals. “The only way to keep our profession safe and to protect patients is to advocate and stay involved,” said Sarah Michaels, a third-year dental student. WVU School of Dentistry students were among 600 of their peers who took advantage of continuing education courses at the 4-day event. Maya Mathai is a second-year dental student who enjoyed informal interactions at the session. “I think it’s such a great opportunity to get ideas from other schools on how to not just improve our ASDA chapter, but our school as well. These breakout sessions are some of the only times we get to interact with other ASDA students face-to-face,” Mathai said. Students were able to network and discuss topics with leading providers and experts. There was an impromptu Mountaineer reunion when students conversed with Bruce L. Cassis, DDS, MAGD, who was a keynote speaker. The 1980 WVU School of Dentistry graduate practices general and hospital dentistry in Fayetteville, W.Va. He is the current vice president of the Academy of General Dentistry and is expected to serve as the organization’s next president. The 2019 annual session was held in Pittsburgh, Pa.